Are Rwandan Teachers Getting Richer? On Monday, January 28, a cabinet meeting chaired by President Paul Kagame approved a 10% increase for teachers’ salaries. Those to benefit from an upward shift in monthly earnings are primary and secondary school teachers from public and government-aided schools. The new salaries will be effective in March this year, cabinet meeting announced. KT Press analysed what the increase means to the welfare of teachers – who have on several occasions complained over low pay. According to statistics from the Ministry of Education (Mineduc), there are 2,499 public primary schools including 1774 government aided schools. Initially, with 41,573 teaching staff in primary schools, it means government spends Rwf1, 746,066,000 ($1.9 million) monthly salary – going by the Rwf42, 000 net monthly salary paid to a primary teacher. With the new proposed 10% increase, each primary teacher will take home Rwf46, 400 (($50) every month, effective March this year. Going forward, a secondary teacher who earns Rwf125, 000 monthly net salary will he it increased by 12,500 – making it Rwf137, 000 monthly salary. There are 21,990 teaching staff in 1332 public secondary schools, meaning that, with a 10% increase, government will spend Rwf3, 023,625,000 every month to pay teaching staff in public secondary schools. “We are thankful to God for something added to our salaries. However, given the current standards of living, we still can’t survive on this salary. But we believe the government will continue adding on something as more resources are got,” one of the teachers from Huye district in Southern Rwanda who preferred anonymity said. 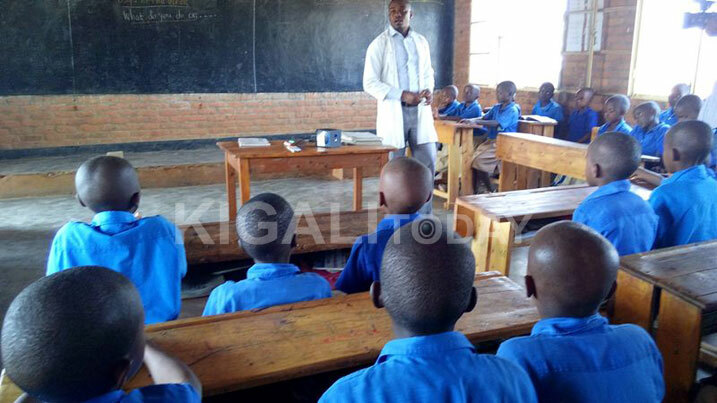 Another Secondary school teacher from Nyaruguru district in the same Province, who only identified himself as Olivier, told KT Press that the new increase on teachers’ salaries “is a drop in the ocean. A teacher cannot easily pay Rwf30, 000 monthly rent. The increase is welcome but doesn’t add anything to improve teachers’ welfare,” he said. According to Olivier, the cost of living is harsh. “For instance, a secondary school teacher who rents Rwf30, 000 house in Nyaruguru, add Rwf21, 000 sack of rice and Rwf13, 000 bag of maize flour…add 5 litters of cooking oil worth Rwf7500 and Rwf20, 000 money spent on other food items, I am excluding this from other costs such as transport. This takes more than your salary,” Olivier said. On top of a 10% increase on teachers’ salaries, government established Umwarimu Sacco – a credit and savings cooperative that offers loans to teachers and staff in both public and private schools at an interest rate 0f 11%.